Sega Genesis Classics [Sega] – Ouch That Hertz! Sega Genesis Classics is the culmination of various Sega Genesis games that were rereleased over five volumes between 2010 and 2012. Eventually, Sega decided to release all five volumes in one massive collection. Classic series such as Sonic the Hedgehog, Phantasy Star, Shinobi, Golden Axe, Shining Force, and Streets of Rage are featured prominently in this assortment of over fifty Genesis titles. There are plenty of different genres to appeal to any gamer, from falling-block puzzlers like Columns to RPGs such as Sword of Vermillion. Despite the plethora of amazing games, many of which I never got a chance to play as a kid, I have to admit my disappointment of a handful of titles that did NOT make it to the console release of this game. Eternal Champions, Sonic 3, Sonic & Knuckles, and the three Ecco the Dolphin games were part of three of the original five volumes, but were not included in the full collection. (It is worth noting that two games from the Wonder Boy series are part of the collection as well, but they were excluded from the Switch version.) 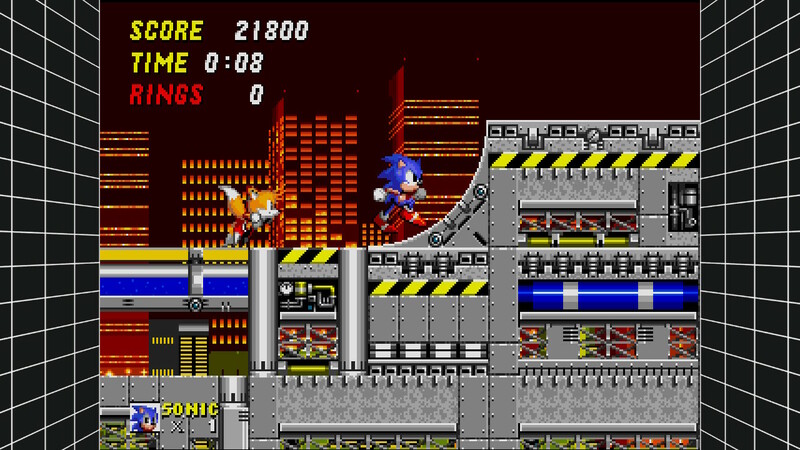 The fact that Sonic 3 and Sonic & Knuckles are missing is particularly painful, as they are my two favorites in the series, but at least we get Sonic Spinball and Sonic 3D Blast to make up for it. Both of those games are highly underrated, in my opinion. Also, I was thrilled when I saw Phantasy Star III in the lineup because it was one of the first RPGs I ever played. Some final gems I want to make note of are the original two ToeJam & Earl games that are in this compilation. I was eight years old when I first played them and they are still just as fun and just as difficult as they were all those years ago. Even though a handful of true classics are missing from the lineup, the sheer volume of high-quality games in this collection makes up for the ones that are missing. As soon as the collection loads, we’re greeted by a video montage of various characters from the titles featured in Sega Genesis Classics as they fight baddies in a virtual world and punch their way through giant Sega Genesis cartridges. My description doesn’t do it justice – it’s actually really cool. After the opening video, we find ourselves in what looks to be a teenager’s bedroom, complete with a Sonic the Hedgehog rug and posters from some of the games in the collection. Aside from the typical bed and desk in the room, there is also a television set and a bookshelf full of Genesis game cases. 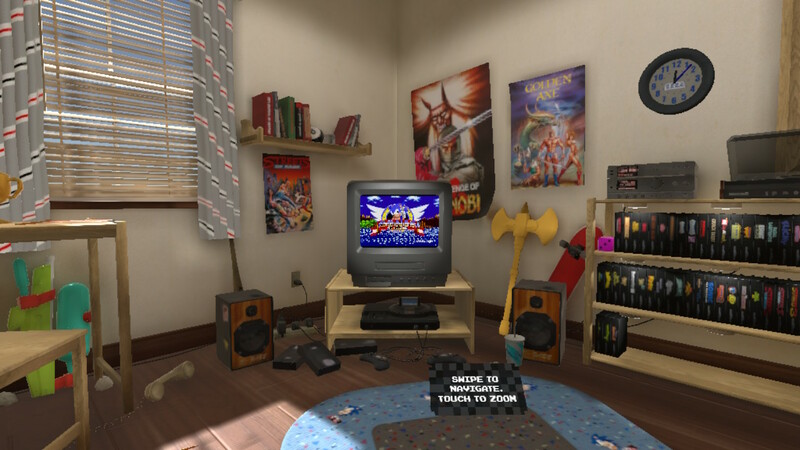 The various options are represented by different props throughout the room, such as the input settings being on a controller and the audio settings on a stereo system. The game library on the bookshelf is used the most frequently, as that is how players will select which game they want to play and there is even a feature to select one’s favorites so they appear on the top shelf. Otherwise, the games are in alphabetical order. Once a game is selected, a cartridge is inserted into the Sega Genesis console beneath the TV and the game begins. The games can either be viewed on the TV set or in full screen, but I doubt many people would want to see a smaller TV on their real TV or Nintendo Switch. Still, seeing the white static on an old television set before a game begins just adds to the nostalgia. I just wish I could blow into the cartridges!